John U. Bacon’s thoughtful and detailed approach in his new book THE GREAT HALIFAX EXPLOSION: A WORLD WAR I STORY OF TREACHERY, TRAGEDY, AND EXTRAORDINARY HEROISM results in one of the best “disaster” monographs in recent memory. The author’s approach is based on empathy and what appears to be a personal commitment to write a clear, concise narrative that is meaningful as it covers all aspects of the catastrophe. Bacon begins by laying out the crisis that came at 9:04 am on December 6, 1917, then retreats and provides a history of Halifax. 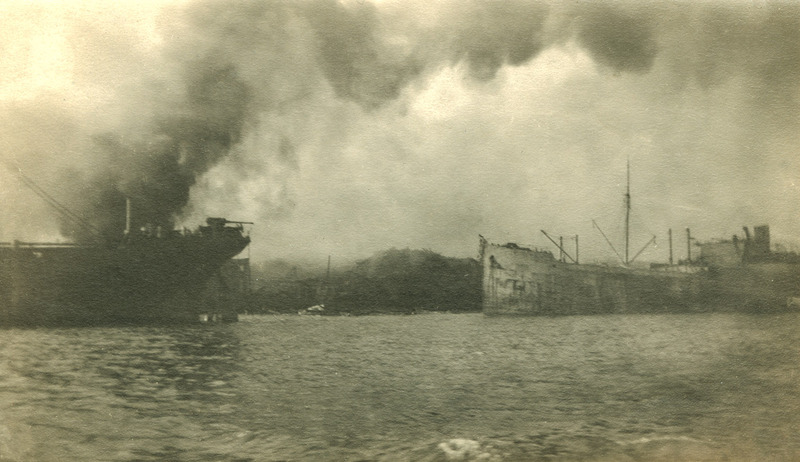 Once you acquire a sense of the city and its geography, Bacon describes how two ships, the Mont Blanc, and the Imo seemed to come together to play a dangerous “game of chicken” in the Bedford Basin outside Halifax Harbor, a game that resulted in the deadliest man made explosion up until the bombing of Hiroshima. The explosion must be seen in the context of World War I. By the time of the collision the war had been ongoing for three years but it had reached a stalemate in the trenches. Once Russia left the war, the Germans would turn their attention to the western front which created an increasing need for explosives to prevent any breakthrough. The Mont Blanc was captained by Aime Joseph Marie Medec who had little time to familiarize himself with his vessel which would carry the largest cache of explosives ever loaded on to a ship – 62 tons of gun cotton, 246 tons of benzol, packed in 494 thin steel drums and stacked three and four barrels high, 250 tons of TNT, and 2366 tons of picric acid, a very unstable and poisonous chemical. The cargo weighed almost 3000 tons, or 6 million pounds. The plan was for the ship to be loaded in Gravesend Bay, Brooklyn, NY and travel up the east coast to Halifax where it would meet a convey for the voyage across the Atlantic. This plan was chosen to offset the threat of German U-boats as convoys of allied ships was deemed the safest way to reach Europe. Bacon presents an accurate portrayal of events leading up to the war in Europe and how the war was fought. Further, he describes the importance of Halifax Harbor to the overall war effort and the contributions made by Canadian soldiers from Halifax who fought in overseas. Bacon choses a number of Haligonians (Halifax residents) who volunteered for the military and fought in the trenches. Through the eyes of Ernest Barrs who fought and was wounded in Belgium at the battles of Ypres the reader gets a true portrait of what life was like for soldiers. Barrs story is an amazing one in that after surviving for two years he is severely wounded. The day of the explosion found him rehabbing outside of Halifax and because of his own medical issues and familiarization with medical techniques he joined a Dr. Elliott to help administer to Haligonian survivors in December, 1917. Bacon introduces the reader to other families whose stories are traced from before the explosion, what happened during the explosion, and after. You become familiar with the Orr, Driscoll, and Pattison families who lived in the Richmond neighborhood in the North End of the city which would be almost destroyed on December 6th. Bacon describes family life, occupations, schooling and the interests of the children to the point where one feels that they know them personally. The tragedy that took place was completely avoidable. Bacon explores the leadership and strategies employed by the captains and harbor pilots for both ships and concludes it was the fault of Captain Haakon From of the Imo. The most fascinating chapter is called “A Game of Chicken” where Bacon describes the path of both ships, the Mont Blanc heading north to meet a convoy in Halifax, and the Imo traveling south toward New York to load supplies for a return to Europe. The Imo was supposed to stay on western side of the Narrows and the Mont Blanc on the east. The Imo would move to the center and refused to accommodate the Mont Blanc which was following the correct navigational protocol. The Imo finally decided, too late, to move to the side it was assigned as Capt. Medec moved to the east to avoid a collision, but it hit the Imo. With the cargo on the Mont Blanc, devastation could only result. Bacon provides a blow by blow account up until 8:46 am when the Mont Blanc’s cargo ruptured. 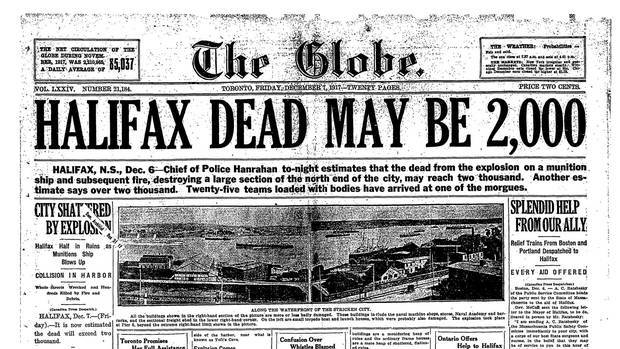 The result was the total destruction of the north end of the city, the death of almost 2000 people, 9000 wounded, and the loss of almost half the homes in Halifax. Bacon takes the reader through the mobilization of resources, the bravery of first responders, and the generosity and selflessness of the survivors who tried to help the victims and each other. At the outset many believed it was a German attack. However, soon reality would set in allowing Bacon to compare the experience of trench warfare and the catastrophe that befell Halifax. The shock and emotions today would be called Post Traumatic Stress Disorder, but at that time people did not know what they were dealing with. The “instant refugees” wandered looking for parents, children, and other family members, for many to no avail. Bacon returns to the families that he introduced earlier in the book and explains what they went through. Bacon goes on to describe the tsunami that resulted from the blast as well as the blizzard that arrived the next day in Halifax, furthering the suffering and hindering rescue and recovery attempts in a city that had 900 hospital beds remaining, with 9000 injured needing medical treatment. A major theme of the narrative involves the historical relationship between Canada and the United States. For 141 years it seemed the United States worked to annex Canada provoking anger and fear on the part of our northern neighbors. The Halifax explosion altered feelings between the two countries due to American support and generosity. Many Haligonians were stunned by the massive relief effort that arrived from the United States, particularly the large number of doctors and nurses that resulted in setting up their own hospital to treat the victims. A major result of this crisis was the cementing of Canadian-American relations, and an alliance that has stood the test of time up to the present. Bacon’s account is extremely thorough based on letters, diaries, oral histories, and other archival material he consulted. He describes how word of the disaster spread and how surrounding towns and communities provided doctors, nurses, soldiers, first responders, businessmen and others to assist as much as they could. The people behaved in an amazing fashion, so much so that looting was not a problem. Boston is singled out for their aid and assistance in a wonderful chapter describing the work of Massachusetts Governor Samuel W. McCall and Abraham C. Ratshesky (known as A.C.) who led Boston’s substantial relief effort. The author follows the aftermath of the explosion taking the reader through the investigation and the long drawn out court proceeding over a period of years. He concludes the narrative by bringing up to date information about the survivors and their families. The book is a heart rendering account that is hard to put down, and highly recommended.